The Hayling Billy trail runs all the way up the west side of the island starting in West Town and ending near the bridge. It is open to walkers, cyclists and horse riders (although not technically a bridleway). It continues on the mainland, but with a much better sealed surface, crossing the main road at Langstone, past the Spring Centre in Havant and ends at Havant railway station. Since its creation from the old railway line in the 1980’s, following a campaign by a group of cyclists inspired by Sustrans, its condition has deteriorated badly. Nowadays, you need a pretty tough bike and a pretty tough rider, and in the wet you’ll get plastered. Worse, a section of the trail collapsed into the sea in 2015. That was repaired (leaving a very poor surface) but the repair was only temporary, and it remains vulnerable to the sea. Amazingly, the official sea defence policy is still to ‘do nothing’. These issues don’t just affect cyclists, but also walkers, push chairs, prams, mobility scooters and wheelchairs. 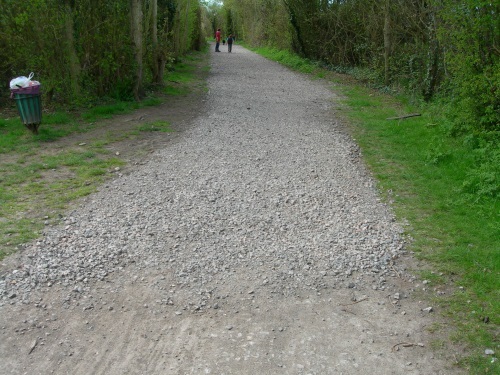 Cycle Hayling is therefore campaigning to defend and restore the trail with a properly drained, all-weather surface. The mainland section of the trail shows what is possible. At the north end, an orange, sacrificial, self-binding gravel has been tried. The jury is still out on whether it’s a good enough surface in all weathers, and on how long it will last, but in any event, it couldn’t be used in more exposed sections – it will just wash away. So we’re still looking for a surface that is acceptable to all users and to all stakeholders, and for the money to do it. However, we are actively working to upgrade the Saltmarsh Lane footpath to cycling, which links the Billy Trail to West Lane, thanks to council funding. And we’re planning a new Smooth the Path surface that will be better, not just for cycling, but also for pushchairs, disabled buggies and child scooters. We hope this will give us good evidence of what works and what can become acceptable in such a sensitive area. This is early days in what is likely to be a long-term project. If you would like to know more, please contact Andy Henderson at Andy@cyclehayling.org.uk or Wilf Forrow at Wilf@cyclehayling.org.uk. Will there even be a Billy Trail in future? The sea will eventually breach the Billy Trail if nothing is done – we just don’t know whether it’s 1, 10 or a 100 years away. The last official Environment Agency status was ‘No active intervention’. However, this is clearly not the policy in practice, as the last breach was patched up. Past policy was solely determined by the resulting financial losses, so an empty part of Hayling was not considered ‘valuable enough’ to protect. And even if we had the money, some engineering solutions are precluded by very sensitive ecological and political issues. But things are changing. The community and ecological value of the Trail are now starting to be recognised. Hampshire County Council (the owner of the Billy Trail) is now committing in principle to replace any trail destroyed, by moving it inland. The harbour coastline is now managed by the Eastern Solent Coastal Partnership, and we understand they are working around all 3 solent harbours, looking at each length in turn, and have now got to Langstone village. This gives us confidence that there WILL be a Billy Trail forever. Won't resurfacing destroy the nature of the trail? It’s fair to say that until the sea defence issue is resolved, discussing investment in a new surface is difficult, but at least maintenance of the Billy Trail is now in Hampshire’s long term plans. Up ’til now, the only surfaces deemed to be generally ‘acceptable’ have been natural surfaces like scalpings or hoggin. However, even with the latest attempt, self-binding gravel, we haven’t yet found a natural surface that is ‘acceptable’ to most of the public for everyday cycling, not just for a social ride on the finest, driest days. And that is ‘unacceptable’. And it’s completely contrary to the Active Travel Policy and Cycling Policy of both Hampshire and Havant. We often ride in rural Hampshire and West Sussex, on paths that fit perfectly well with their natural surroundings and the environment, and yet have sealed surfaces. We remain optimistic that we can find one for the Billy Trail that is acceptable to all users and to all stakeholders, and without taking away from people’s enjoyment of the path. Our new Smooth the Path surface for the Saltmarsh Lane footpath will be an important stepping stone towards that. Not just for cycling, but also for pushchairs, disabled buggies and child scooters. It is the best part of 30 years since John Grimshaw, founder and leader of Sustrans, conducted a comprehensive study of the Billy Tail, with the recommendation that it should be upgraded to an all-weather path, enabling all types of users convenient passage at all times of the year. Hampshire County Council purchased the Trail at a nominal sum from British Rail, following the closure of the railway in 1963. But they have consistently resisted this all-weather recommendation, citing its nature reserve status and the needs of horse riders. English Nature (now Natural England) then wished to impose a ‘managed retreat’ policy, thus allowing vulnerable sections of the Trail to be at risk from the tide. 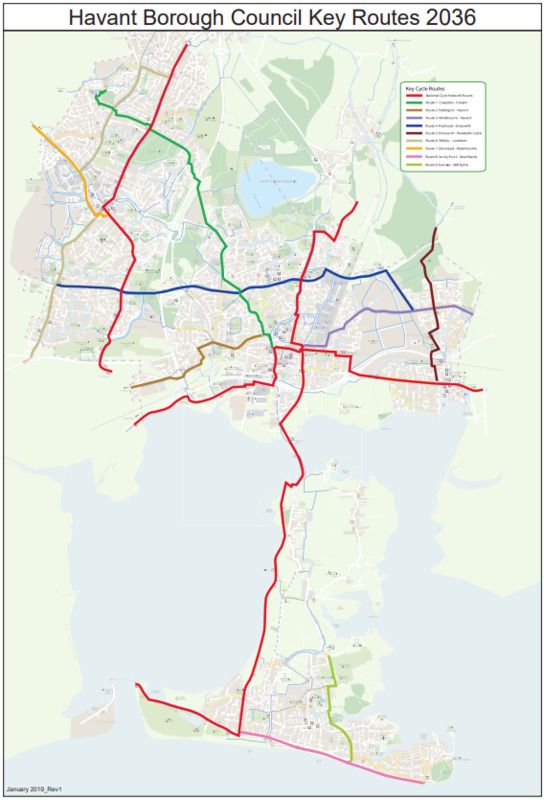 Once again, HCC took this as an opportunity to avoid contemplation of upgrading the trail, despite having by now upgraded the northern sections on the mainland, bowing to pressure from local residents. Fortunately, the power of Natural England to dictate policy towards the western coast of the Island has receded and the Environment Agency now have control. They may have even recently changing the policy to ‘hold the line’, meaning that the route of the Billy Trail will be protected. HCC, therefore, have no excuse not to upgrade the Trail, other than citing a lack of the necessary finance. It is to be hoped that we can secure funding for the whole Trail to be properly upgraded in the not too distant future. An upgrade will not just benefit existing users, principally cyclists (75%), walkers (21%) and horseriders (4%), but also disability ‘buggy’ drivers and runners. Indeed, Mike Williams of Havant Athletics Club, organisers of the Hayling 10 and Rob Piggott, organiser of the Portsmouth Marathon, with both events using the Trail, are critical of the state of the Trail and fully support our upgrade campaign. Finally, The Billy Trail has been designated part of the ‘The Shipwrights Way’ project from north Hampshire to Portsmouth and at least two original sculptures are to be erected alongside the Trail, reflecting some aspect of the trail and local history. Let us hope that these works of art are not soon covered in mud! If you want to support our efforts, please subscribe to the supporters’ newsletter. As reported in today’s Portsmouth News (see http://www.portsmouth.co.uk/news/cash-grant-set-to-give-hayling-billy-a-new-lease-of-life-1-5763502) the Peter Drury HB50 project to mark the 50 years since the last Hayling Billy steam train, has now been successful in gaining Lottery funds of nearly £90k. Well Done Peter and we look forward to seeing the improvements on the island part of the Billy Trail. 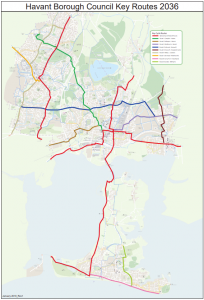 Completion of the links between the Langstone section of the Billy Trail and the Hayling section making it possible to use off-road cycle paths to travel between West Town and Havant – with just a few road crossings. Signposting of a cycle route to the west of Beachlands taking people onto Ferry Road to the East of the Golf Club. We understand that there might be other developments taking place at the same time and that some work could be completed well before next Spring. You can find the full list of Havant’s published cycle maps here. We initially heard from Andy Leneghan that the Partnership for Urban South Hampshire (PUSH) had allocated £60K to improve access to leisure trails. We’ll publish more details as we learn them. The stones that made the South end of the Billy Trail difficult and potentially dangerous have been removed. Cycle Hayling and several users of the Billy Trail raised concerns through a number of contacts, and they have been heard. There is a large pile of the stones in the car park next to HIADS. Hopefully they’ll be removed and not redeployed on the trail. You should be aware, however, there are still some stones left on the trail. Some care is needed to avoid them. The Hayling Billy trail is a great facility shared by walkers, cyclists and horse riders. At various times of the year it supports many kinds of cycling, and many kinds of cyclist. There is a regular band of commuters using the trail as a pleasant traffic-free start and end to their day; and some off-island commuters use the trail as an alternative way to Portsmouth (via the ferry) rather than ride around the mainland and down Portsea Island. The trail is popular with weekend leisure cyclists. Young children learn to ride their bikes along the trail. It’s a nice route if you go shopping in Havant by bike. Cyclists ride the trail on mountain bikes, hybrid bikes, touring bikes or their shopping bikes; out and out racing bikes can be difficult because they work best on smoother surfaces, but ridden slowly and carefully a racing bike can use the trail … most of the time. But some of the time the trail is difficult for all bikes.